The Rohde-Schwarz SMB100A is available to buy refurbished used or rent, usually from our UK stock. Click here to download the Rohde-Schwarz SMB100A datasheet. The analog R+S SMB100A signal generator delivers excellent signal characteristics and high flexibility at low cost of ownership, perfectly matching the key criteria for a signal source. The technical characteristics of the R+S SMB100A set new standards in the mid-range, especially the generators high output power and signal purity. The R+S SMB100A provides RF characteristics that are exceptional in its class, making it an excellent general purpose instrument. These outstanding RF characteristics plus its compact size and low weight make the instrument ideal for a wide range of applications. The R+S SMB100A is optimally suited for use in development, production, and service, or, to put it even simpler: wherever an analog RF signal is required. Its wide frequency range covers a large number of critical RF applications. The R+S SMB100A is the perfect choice for applications in the important ISM bands up to 5.7 GHz as well as for EMC applications because of its lower frequency limit of 9 kHz. Furthermore, the R+S SMB100A can be ideally used for measuring the blocking characteristic up to a CW frequency of 12.75 GHz, as specified in various telecommunications standards. When it comes to frequently changing level settings, this is the first time, that a wear free and tear free electronic step attenuator is used in this frequency range. In addition to pure CW signals, the R+S SMB100A also provides the most common analog AM and FM/fM modulation modes as standard. The R+S SMB100A is outstanding for its comprehensive standard equipment and hardly needs any additional options. 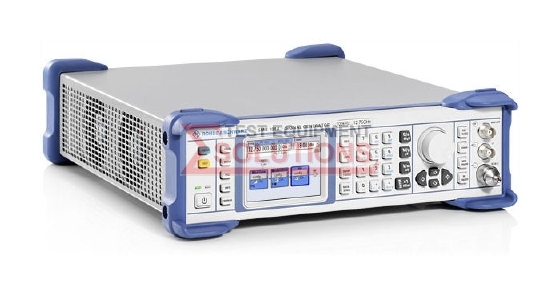 We offer the refurbished used Rohde & Schwarz SMB100A Signal Generator (Various Max Freq To 40GHz) for sale and rental. The Rohde-Schwarz SMB100A is fully tested and refurbished in our in-house ISO9001 calibration laboratory. We supply manuals, accessories, full warranty and a free-of-charge Certificate of Conformity. We can also provide the Rohde-Schwarz SMB100A with a fresh calibration for a small additional charge. If you have under-utilised test equipment talk to us about trading-in or part-exchanging it towards the Rohde-Schwarz SMB100A or other refurbished test equipment.